As a lover of various add-on active and passive MW antennas I was interested in testing the Degen TG39 from the moment I saw a picture of it. I already own two passive loops…the Select-A-Tenna Model M and a Terk AM Advantage, and they are both excellent loops, but what struck me about this new model is its appearance. Harking back to the old days of AM radio, when loops were commonplace, the TG39 is built on a wooden frame with the loop wires visible…not hidden in a modern plastic shell as most loops are. It is a basic, tuned passive design and was in fact designed by the same person who designed the well known DE1103 radio. 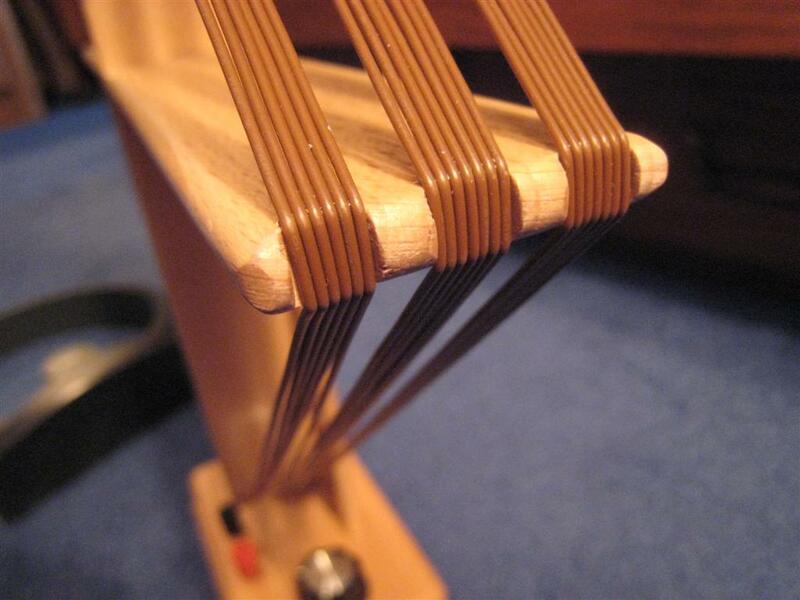 The TG39 is a passive loop design requiring no power of any kind. It has only two controls. On/Off and Tuning. Generally such loops are used with no direct connection to the radio…as long as your radio has a built-in ferrite rod it will work via inductive coupling. Simply place the TG39 next to your radio at right angles to its built in ferrite rod, move the antenna and radio around bit to find the “sweet spot”, and away you go. There are also binding posts for connection to a radio with AM antenna inputs…these work best into high impedance inputs…the signal is greatly attenuated at low impedance (50 ohm) inputs. The loop measures approximately 11″ v 11″ and sits upon a nicely-detailed wooden base which also holds the binding posts and two control knobs. The antenna arrived extremely well packed. It was fitted inside a made-to-fit box of exact dimensions and was so protected and taped with Styrofoam that it was actually quite a task to unpack it. The effort was well worth it though…I am confident that this excellent packing arrangement will ensure these units won’t be damaged in shipping. Setup and use of the TG39 is the same as with the Select-A-Tenna (I’ll refer to that as the SAT from here on) and the Terk. 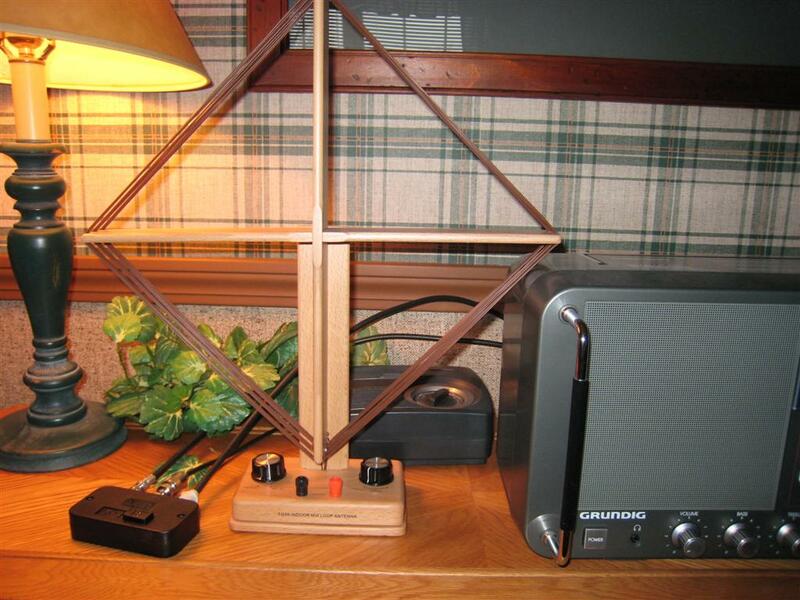 Simply place the antenna adjacent to the radio at right angles to its internal ferrite rod antenna, turn the switch to “on”, tune the radio to a weak AM station and tune the tuning knob on the TG39 until you hear the signal peak. This is best done with a weak signal in the daytime…at night most signals are so strong that they tend to mask some of the obvious effects of a passive loop. The loop antenna signal is radiated via induction to the ferrite rod within the radio…this is rather amazing the first time one witnesses it. Setup is easiest on a radio with a signal meter, but if the signal is weak enough to degrade reception you should hear the improvement when you approach the correct tuning point. Now slide the radio and antenna around relative to one another until you find that position where the antenna’s output to the radio is peaked…you don’t have to repeat this process…this “sweet spot” will remain the same for all signals. 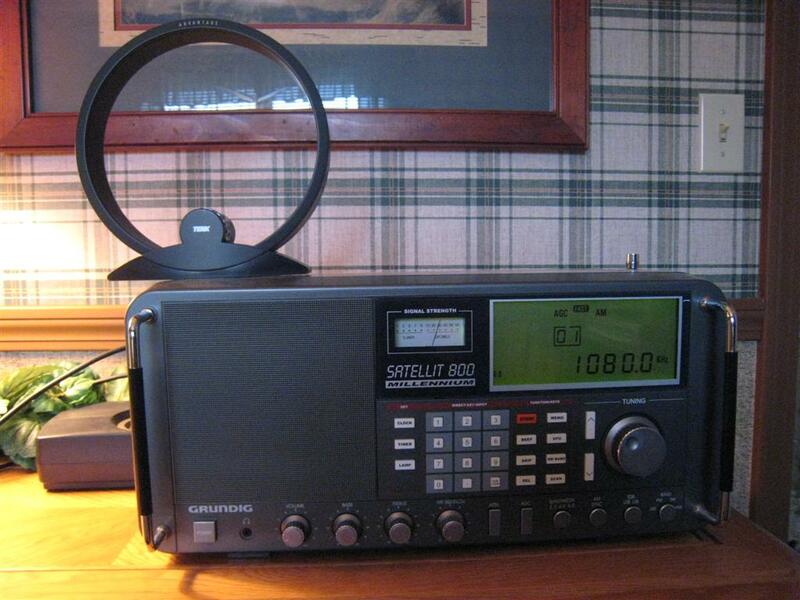 If you get too much signal you can move the antenna slightly away from the radio…a poor man’s gain control. In the case of radios without a built-in ferrite rod AM antenna you will have to use the direct connection…passive loops work via induction only with ferrite rod-equipped radios. The TG39 sports binding posts which will accept bare wires, spade lugs or banana plugs…you will have to fashion or buy a cable to mate with your radio to make the connection. Via Inductive Coupling: These passive loops are most often used with no direct connection to the radio. My first tests utilized a Grundig Satellit 800 which has an S-meter. The internal ferrite rod in this radio is located at the top left and is oriented front to back (very early Satellit 800′s used a different position but most are like this one). As you can see from the meter readings, the TG39 worked well sitting just to the left of the radio where its windings were very close to the radio’s ferrite rod. Both the SAT and the Terk worked best sitting atop the radio…their round shape kept their windings too far from the radio’s ferrite rod when sitting to the left. However the important thing is the S-meter readings…all three produced significant gain on this same signal as you can see…well in excess of 20 db. I also noted that each of these loops provided a significant signal to noise ratio improvement, helping to reject some local interference from a nearby computer. The SAT’s gain appears a few db lower in these pictures. I would not place too much weight on that. These loops are not optimum sitting precariously atop the Satellit 800 and are not quite at their best spots for maximum performance. I could get slightly more signal from the Select-A-Tenna by moving it slightly further to the left but then it was in danger of falling off the radio so this is purely an issue of how it happens to sit atop this particular radio. In all other tests it produced the same signal levels as the other two loops. Again, this is not generally an issue with smaller radios as you can place them in close proximity to these loops with fewer problems. I repeated these same tests with several portable radios. With smaller radios it was easier to position each of these three antennas perpendicular to the rear of the radio and to find the sweet spot…again, all three loops produced excellent gain and improvement in signal to noise radio. I used a few radios with signal strength meters and some without and again I could discern no major differences in signal levels with the three antennas…all were excellent. Of course I had to try the TG39 with the Degen DE1103 since the same person designed both. The combination was superb, turning a great little portable into a DXing machine. These loops do amazing things with virtually any radio. Using A Direct Connection: These three loops all have outputs for a direct connection to a radio when needed. When do you want or need a direct connection? For one thing, radios without ferrite rods (such as the Eton E1) will require a direct connection, as will many table and component type radios which use small, untuned wire loop antennas on their back panels. Radios such as the Satellit 800 will also work well with a direct connection, as you can disconnect the 800′s internal antenna and get signal solely from the loop, giving great control and flexibility. No specs are given for this but through experimentation I found that the TG39, like the other loops, works best into a high impedance input. I tried it on several radios with both high and low impedance inputs and verified this. In the case of a radio like the Eton E1, which has only a low impedance input I used a small 9:1 impedance matching transformer and got much stronger signals into the radio than when I did not use the transformer. You could also try connecting the TG39 between the E1′s whip antenna (high impedance) and the radio’s ground to see how that works…it should work well. 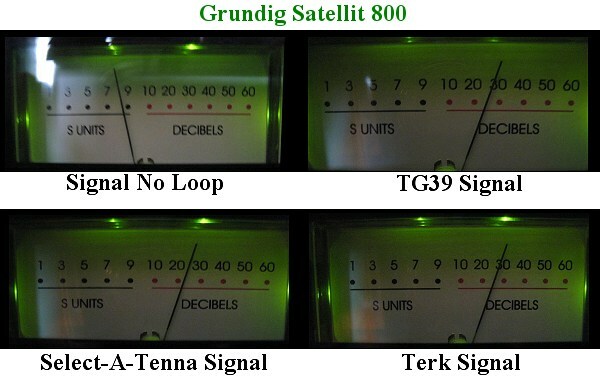 If your radio has a small loop on the back connected to antenna terminals you usually will connect the TG39′s output right across the radio’s own antenna…this usually gives better results than disconnecting the original antenna, but again, this can vary from radio to radio so experimentation is best. Measured signal levels on all three loops were essentially equal varying only a small bit from station to station…sometimes it was mainly a factor of how precisely I could get the tuning knob set one each…when you view the signal level on a meter it is easy to see how a tiny adjustment here can greatly affect the meter reading. Using The Direct Connection As An Input: The direct connections on the TG39 (and the two other loops) can also be used as an input. 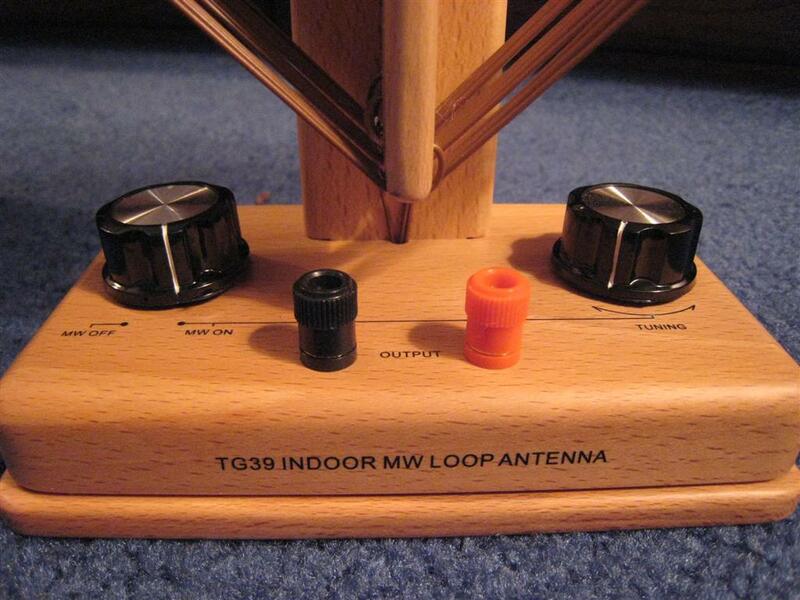 If you are in a situation where the signal outside is much better than inside, such as in a shielded, steel-frame building, you can connect an external antenna to the terminals of the TG39, then use the loop to couple that signal to your radio, using its tuning knob as a pre-selector. I did not test these antennas in this configuration but have read from many sources that this setup can be highly effective. As with most antennas…experimentation is the key to success. OK. I must admit, I had to wonder “Why did Degen include an On/Off” switch on a passive loop”? No other passive loop has one…after all there is no power being used…thus no need to turn it off. I thought of two possible reasons. The first…maybe an amplified version is in the works? We’ll have to wait and see about that. Second, I have found a few cases where it was nice to be able to turn off the signal without disturbing the tuning adjustment or loop position. OK, maybe this is not a crucial function but it doesn’t hurt anything and I can see no reason to complain about its presence. It does add a certain symmetry to the design. 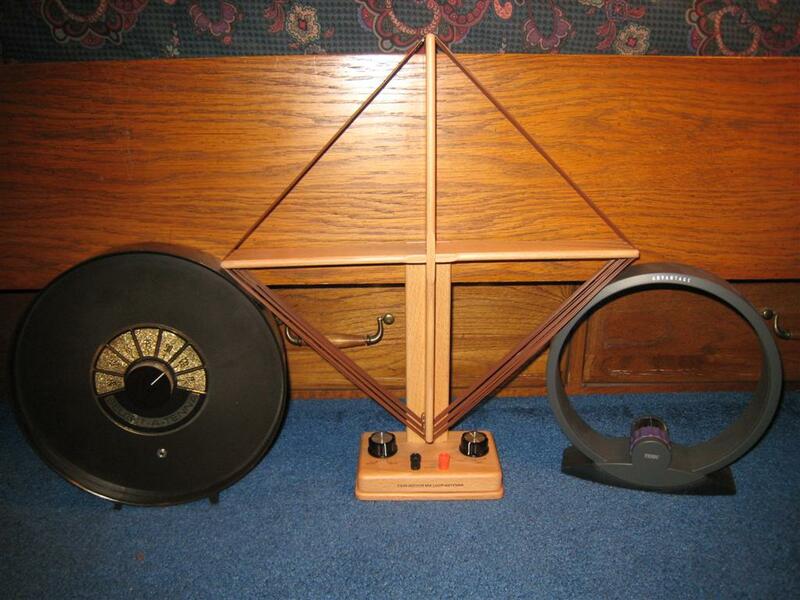 The Degen TG39 AM Loop Antenna is a masterpiece of design. Made of real wood it looks like the old-style loop antennas from days of old and for its appearance alone I am proud to display mine. Operationally it seems pretty much the same as the Terk and the SAT. By comparison they are plain and contemporary looking…and a birt smaller. The TG39 announces itself clearly….it virtually shouts out, ‘Hey…I’m an antenna!” and if you’re an antenna lover as I am, you’ll love it.